ragu | This Girl’s Gotta Eat! Milanese is a breaded meat cutlet that is traditionally dredged in an egg, flour and breadcrumb mixture and pan-fried. 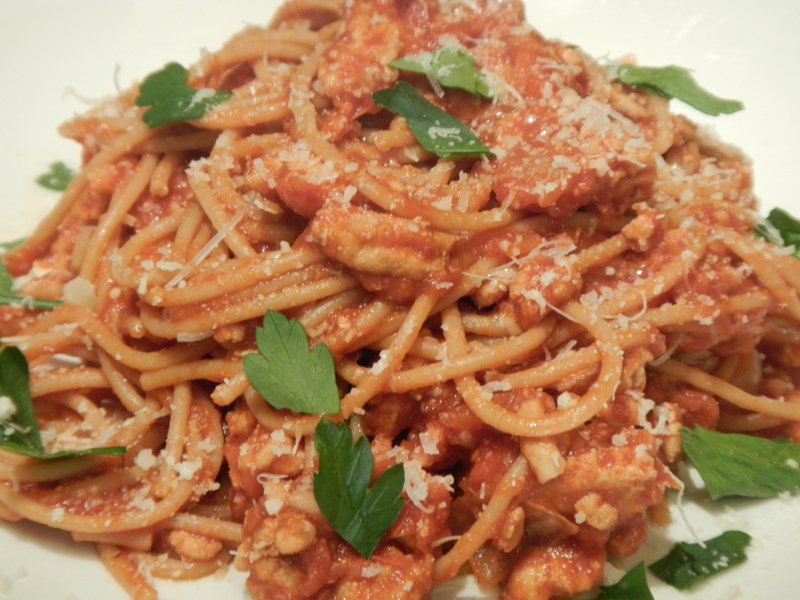 I’m offering a healthier version on this Italian classic. By only dredging in oil and panko, and baking verses frying, you can still achieve a deliciously, crunchy coating. To butterfly the chicken, cut breasts in half lengthwise almost to the end, just be careful not to cut all the way through. Unfold the top half to lay flat. Whisk 1/3 cup of olive oil with the lemon zest in a medium bowl. Add the cutlets and marinate in the fridge for 30 minutes. 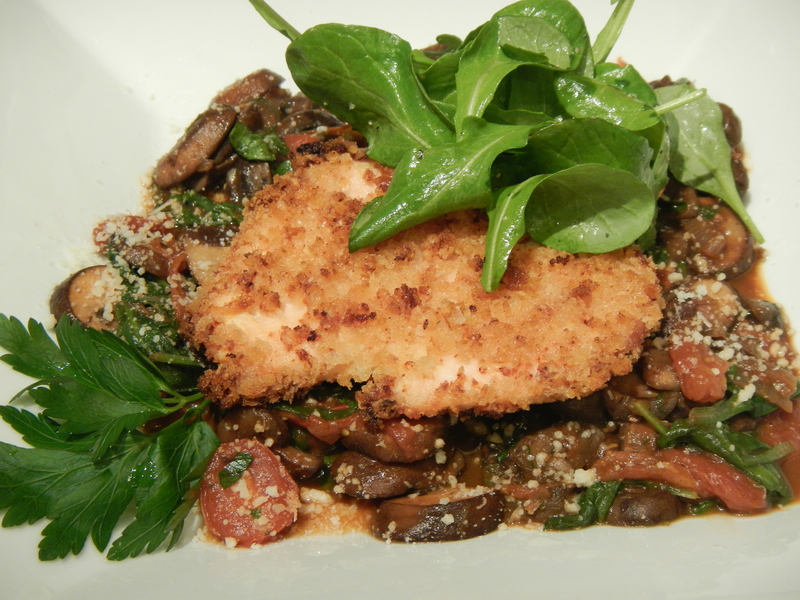 Combine the panko and parmesan in a shallow dish. Dredge the marinated chicken breasts in the panko mixture, pressing the chicken into the mixture to adhere. I eyeball the measurements here – you can always add more panko and cheese if needed to completely cover all the cutlets. Transfer to a baking sheet sprayed with non-stick spray. Bake chicken for 20-25 minutes, or until browned on both sides and cooked through, turning half way through. While the chicken bakes, work on the ragu. In a large saute pan over medium heat, saute shallots in the leftover flavored oil you used to marinate the chicken in until soft. Increase heat to medium-high, add the mushrooms and saute until brown, stirring occasionally. Stir in tomatoes, broth, sherry, vinegar and tomato paste. Bring to a boil, then reduce heat to low and simmer for 15 minutes. Wilt in the spinach and season ragu with salt and pepper to taste. Finish with parsley and thyme. To serve, plate the ragu and top with a little parmesan cheese. Add a piece of chicken, garnish with a squeeze of lemon juice and fresh parsley. Top with a little arugula dressed with lemon juice, olive oil and a salt and pepper to taste. Bolognese sauce is an Italian meat-based sauce in which the meat is traditionally braised. 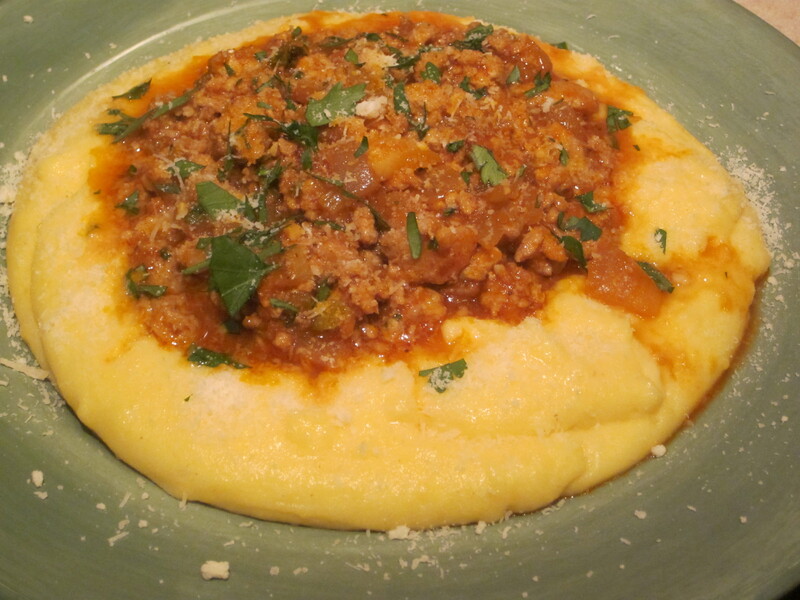 It can take hours to develop a classically deep, rich Bolognese sauce. This is my recipe for a healthier version of this classic, that can be made quickly and even enjoyed during the week! Preheat a large skillet over medium-high heat. Add olive oil, a few good turns of the pan. Add chopped onions and saute until softened, 3-5 minutes. Add garlic and pinch of red pepper flakes and saute until fragrant, 1 more minute. Next add the chopped celery and season with salt and pepper. Using a hand-held grater or microplane, grate the carrot right into the skillet. Cook veggies together for 2-3 minutes. Next add the ground turkey and brown along with the veggies – be sure to break up the turkey with a spatula. Add tomato paste, salt and pepper to taste and mix well into the turkey and veggies, cook for another minute. Next, deglaze the pan with the red wine and cook for another minute until the wine is well incorporated. Finally, add the crushed tomatoes and bring to a boil. Cover and lower heat, simmer sauce for 15 to 20 minutes, stirring often. If the sauce starts to look dry or starts to stick to the bottom of the pan, add more red wine – 1 turn of the pan at a time. Meanwhile bring a large pot of water to boil. Season liberally with salt and cook pasta to al dente according to package directions. Drain.